To become the mental architect of the universe is the ultimate purpose for the evolution and perfection of the mental body, birth, death, and rebirth – reincarnation. WHY AM I PSYCHIC? is about the spiritual journey of a clairvoyant reader, and the knowledge she has acquired over the past forty years. This information encompasses the understanding of the kundalini, chakra system, consciousness, higher and lower consciousness, mental energy drain, planes in the universe, and the reason why a person is psychic, etc. The secret of the universe and the true divine mystical key are revealed. By understanding the knowledge of mind, along with information on the process of psychic development, other clairvoyant people will be able to expand their gifts. This book is clearly written and fascinating. I strongly recommend it to anyone interested in gaining an understanding of the knowledge of the mind. Hopefully, this book will clear up some of the "mystery" about psychics and help other people gifted in this area to understand and improve their abilities. The book is interesting indeed. This book was written by the most talented Clairvoyant reader I have ever met. Elizabeth has opened the mystical world of the Psychic for our deeper understanding. God bless her for the work she has done! So if you want to know more about this subject, this is the first book to read. In reading Elizabeth's book I found that it put a lot of questions that I have had into prospective. It also made them easier to understand where they fit into my life. I started reading the book and could not put it down until I finished it. I especially enjoyed reading "THOUGHTS". 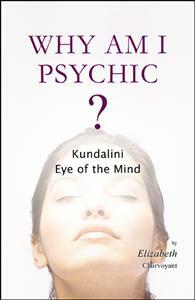 I will definitely read "Why Am I Psychic?" again and again as I feel I will learn something each time I read it. Thank you for such a pleasant reminder of how magnificent the mind is and how to "stay in tune" with the inner soul. I learned so much from you at a young age and was so happy to receive a copy of your book. The poetry was absolutely "wonderfilled" and I keep it close for accessability at any time. As you may know, one of your common phrases I remember, as a child, was; "so, I am picking you up"...that became a household phrase as we all grew to understand our individual psyche. Thanks again and many good wishes to you on your fantastic journey!